Terra Promessa Now Top 2016 Kentucky Oaks Contender: The Kentucky Oaks field has added a new filly to their starting gate. Terra Promessa won the Grade Three Honeybee Stakes over a muddy track and some good fillies like Nickname and Marquee Miss, who stopped after entering the stretch. Terra Promessa has now won three in a row and skipped to victory in her stakes debut. Terra Promessa is a homebred of Stonestreet Farms. Her sire, Curlin, raced for Stonestreet after a private purchase in his three-year-old year. 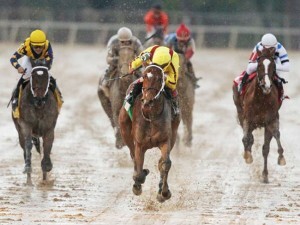 Curlin is one of the best horses to grace the racetrack in recent memory. In 2007, he made a Triple Crown run, attempting to end the Curse of Apollo. However, he finished third in the Kentucky Derby behind Street Sense and Hard Spun. He then came back to win the Preakness and finish a tough 2nd in the Belmont Stakes to Rags to Riches. 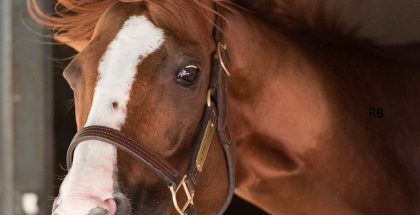 However, after a successful summer, Curlin ended 2007 with a win in the Breeders’ Cup Classic, and two shiny Eclipse Awards: Champion 3-Year-Old and Horse of the Year. Curlin would return to have a successful 2008 campaign, highlighted by his Dubai World Cup win. He collected two more Eclipse Awards also: Champion Older Male and Horse of the Year. Retiring to stud in 2009 as the first North American horse to earn more than $10 million. Curlin initially entered stud for a price of $75,000 but by 2013, he was priced at only $25,000. In 2013, however, Curlin’s first crop were three-year-olds, where he sired Belmont Stakes winner, Palace Malice. Curlin currently stands at Hill n’ Dale for his first season at the farm. His stud fee is $100,000 for 2016. Terra Promessa is out of a mare named Missile Bay, a minor stakes winner. All of her wins came on the dirt while sprinting. Her sire, Yes It’s True, was also a sprinter with his best year coming in 1999. Yes It’s True won the Grade Three Swale Stakes, the Grade Two Riva Ridge Stakes, and the Grade On Frank J De Francis Memorial Dash Stakes, along with multiple other stakes. He lost the Eclipse Award for Champion Sprinter, however, to a very good horse in Artax. At stud, Yes It’s True have sired successful sprinters like The Big Beast and La Verdad. Pedigree suggests that nine furlongs should be just fine with Terra Promessa. She runs like she could run all day, with her massive stride and amazing reach. Terra Promessa now has won three in a row and looks to be a prominent force moving forward on the Kentucky Oaks trail. After her Honeybee win, Terra Promessa has 50 points toward a potential start in the Kentucky Oaks. The Asmussen-trainee is pointed to the Fantasy Stakes next.